I had big plans this year to plant a garden over at my mom’s house (she has the perfect space for it) and work in the garden all summer. Summer is now over and I didn’t make it over to work in the garden at all. My mom still filled our fridge with potatoes, carrots, lettuce, beans and more but now she jokes that I think vegetables come out of the ground washed and bagged. Ha! Maybe I’ll find more time for it next year. With all the potatoes that we’re still enjoying, I needed to be more creative with potato recipes. The Loaded Baked Potato Nachos I made a few weeks ago are still a family favorite. 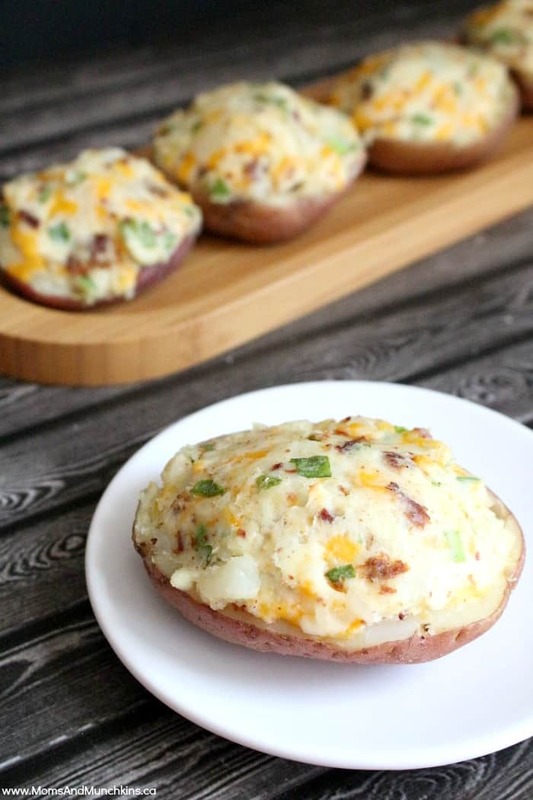 With several of the same ingredients, I made these loaded stuffed potatoes for supper the other night and they turned out so tasty! These are incredibly easy to make. You could even use baby potatoes to make a smaller version for appetizers. A delicious way to eat your fresh, garden potatoes. Using a fork, prick the potatoes several times (on all sides) then microwave on high for 8 minutes (turning them over after 4 minutes). Cut a thin slice off the top of each potato and discard. Gently scoop out the middles of all the potatoes and put into a medium-sized bowl. Scrape the potatoes out down to the skin but be gentle not to tear the skin. Put potato skins to the side. In the medium bowl, mash the potatoes then add sour cream, cheese, onions and bacon bits. Mash well to mix. Spoon the filling back into the potato shells. These can overflow with filling. Bake in the oven for 10 minutes. Serve hot or warm out of the oven. 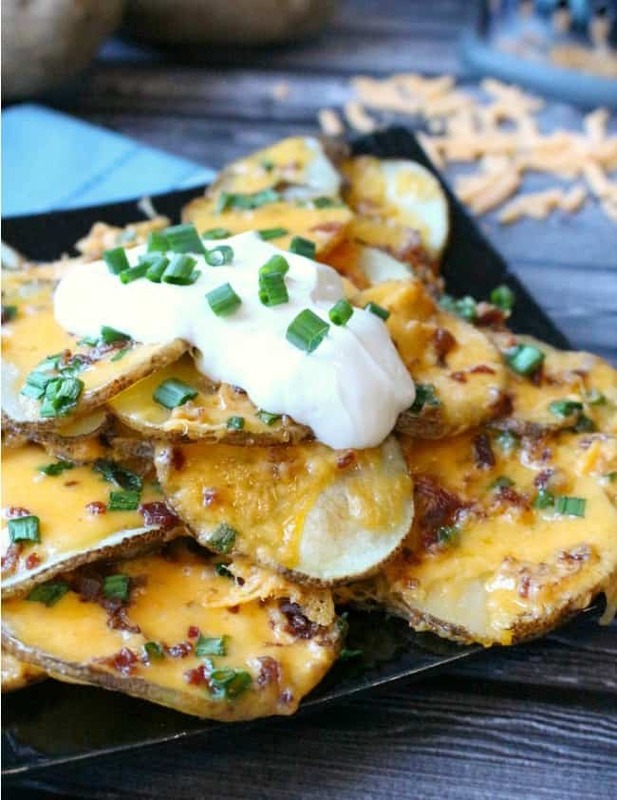 Don’t miss this delicious recipe for Loaded Baked Potato Nachos. For more delicious recipe ideas, visit our Party Food & Family Meals page. Stay updated on our latest ideas by following us on Facebook, Twitter, Pinterest, and Instagram.